I’m waiting for more copy cats to come out of the woodwork after seeing two different organizations perform some “think twice” magic recently with their efforts to get clicktivists to do more than just click. First, I saw UNICEF Sweden launch a “Likes Don’t Save Lives” campaign. You try reading the ad copy, “Like us on Facebook and we will vaccinate zero children against polio,” and tell me you aren’t going to think twice at feeling satisfied that you’ve done something – and can stop there – after clicking some cause’s Facebook Like button. Then, Crisis Relief Singapore, a disaster relief organization, came out with a different set of ads – same message, but even more visually jarring to make their point. Guilty as charged! 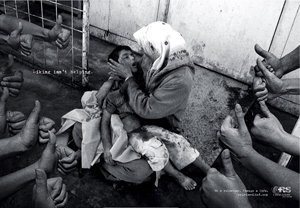 A little photo-shopping of real news photos of disaster victims combined with photos of hands with the thumbs-up and the tagline, “Liking isn’t helping” and they got through with a emotional punch to the gut. Pictures transcend language, invoking empathy and understanding. Think back on Dorothea Lange’s photo of a migrant mother which became the face of the Great Depression. The photo triggered an immediate public outcry, prompting the federal government to send food and supplies to the impoverished areas. The “photograph that ended a war”—the murder of a young Vietcong soldier—not only earned a Pulitzer Prize but also helped sour Americans’ attitudes about the Vietnam War. These remarkable photographs and countless others show how images can trigger emotional reactions that, in turn, can change the world in ways from small to big. There’s hard science behind this; our brains are wired to remember things that have emotional significance. The amygdala is the part of the brain that processes emotions. As John Medina in his book Brain Rules explains, “The amygdala is chock-full of the neurotransmitter dopamine, and it uses dopamine the way an office assistant uses Post-it notes. When the brain detects an emotionally-charged event, the amygdala releases dopamine into the system. Because dopamine greatly aids memory and information processing, you could say the Post-it note reads ‘Remember this!’” Cater to the amygdala; take advantage of people’s natural memory making-process with relatable visuals that stir your audience’s passion. Visuals can harness attention effectively, especially when paired with a strong, accompanying message. Emotionally-charged photos and videos, like those done by UNICEF and Crisis Relief Singapore, sear the images in our mind, in our memory, and serve as an emotion-driven call to action. I like that.